By Justine Canady, UCL student activist and Student Left Network’s candidate for NUS President. Marketisation, privatisation and profit-making in higher education is intensifying the exploitation of workers on campus. Students on campus are organising in solidarity with staff, running campaigns alongside trade unions. The past couple of years have seen a spate of victories, for example at SOAS, KCL and Goldsmiths. We know these campaigns can win. It’s vital to remember that these victorious workplace struggles, led by the workers and their unions, were given a massive boost by acts of student solidarity. At LSE, KCL, SOAS, UCL and Goldsmiths students joined pickets, organised protests, disrupted and occupied campus spaces. This all garnered press attention and added to the pressure on management to negotiate with the workers and meet their demands. I’m currently involved in the Justice for UoL Workers and the UCL Justice for Workers campaigns to bring staff in house and for secure hours and pay. This solidarity in struggle should be extended to our lecturers and teaching staff too. Just like the cleaners and other campus workers, it is university management that is to blame for the insecure conditions many staff find themselves in. And of course, it is university management that charge us extortionate rents, refuse to provide us with inadequate mental health services, and so much more. Management is our common enemy and as students we should stand in solidarity with all workers fighting for their rights on our campuses. Whilst they rake in money from exploiting students through fees, and saving money through condemning their workers lives of in-work poverty; management’s wages only seem to grow. What happened at LSE, Goldsmiths, KCL and SOAS shows us what we can achieve when we stand together. Workers on precarious contracts are disproportionately migrant women, who are also under constant threat of harassment, policing and deportation by the UK Border Agency. Brexit will only worsen this. 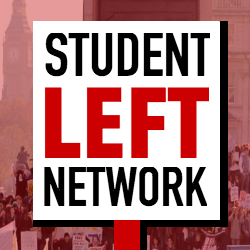 I’m standing as the Student Left Network candidate for NUS President to bring the solidarity and the politics of these campaigns into our National Union. We need an NUS that organises, stands up and fights for precarious workers on campus. NUS should work alongside the trade unions to campaign against outsourcing, precarious contracts, low pay and redundancies. It should help spread the campaigns to student unions and campuses across the country in both HE and FE. For this to happen we need a democratic and campaigning NUS with real control in the hands of students. Just like the campus trade unions leading these struggles, our National Union must lead the fight to defend and extend our rights as students.